Sometimes, history gets lost. And I don’t mean long ago, far away history like those places or events that are ancient, but the history of less than a hundred years ago, right outside your own front door. History, like the generation of people who share an experience or memory, begins to fade away if people don’t document and share it. I first became aware of this fact while looking for information about an abandoned zoo in my own hometown in Wilkes-Barre, Pennsylvania. The Kirby Park Zoo (1932-1936) was wiped out by the flood of 1936. Now a little less than 80 years later, all that I can find about this local attraction are little bits and pieces of conflicting and incomplete information. The generation of people who would have visited the Kirby Park Zoo as children is quickly dwindling in numbers, and unless someone happens to come across photos while cleaning out a deceased relative’s house and decides to donate them to one of the local Historical Societies, I fear that the Kirby Park Zoo and its Olmsted Brother designed bridal/walking path that wound through that area of the park just a few decades ago, will fade away as part of Luzerne County’s lost history. 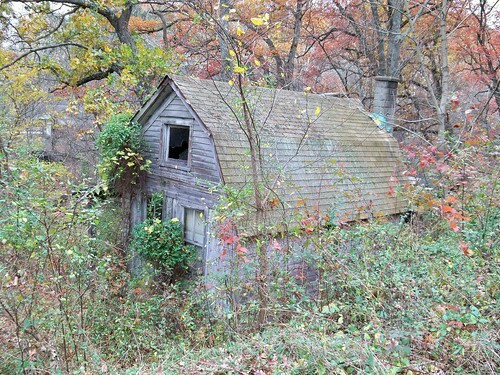 Luckily for another Luzerne County attraction, Ellen Geisel of Honey Brook, Pennsylvania, has generously come forward to share pictures that will save Croop’s Glen, a long abandoned amusement park along Route 11 in Hunlock Creek, from the threat of fading into oblivion. I first became aware of Croop’s Glen last spring. I was amazed to look down into the little valley where the park is situated to see remains of buildings being swallowed up by time and Mother Nature. In a quest discover more about the park, I first went to Defunct Parks.com and found a few lines of information along with three pictures of a rollercoaster. Next, I visited both the Plymouth Historical Society and the Luzerne County Historical Society and found very little additional information in their collections—a newspaper article about the collapse of a pavilion on the property during a picnic and some pictures of members of the Croop family standing next to a car. Neither organization had ever received any pictures of the park to add to their resources. I know it seems hard to believe that an amusement park that closed during the ‘40s because of WWII, but was used for the picnic grounds (possibly, and dance hall until early 1950’s), didn’t seem to have one image available less than 70 years later. Croop 50- carousel – Again Charles is in the center looking at the camera. Thank you Ellen for making our history a little more complete! click right HERE for more Croops Glen Updates! There is a large gear or cog of some sort corroding away on the north side of Route 11 near Hunlock Creek. I’ve always wondered why it’s there and where it came from. I wonder if it could be a part of a ride from this park? Don Williams posted a piece on the flood of 1936 that icluded images of bears in a cage at the Kirby Park Zoo. Which raises the question: why would you have bears in a local zoo? Might as well have deer, skunks, and rabbits, too! You want to see a bear around these parts, just wait a while. Who knows? ! I found all kinds of mechanical stuff in and around the property. There was some farming equipment on the property too….so I guess it could be from anything. I’ve seen a picture of the Kirby Park Zoo bears during the flood in one of the local papers….But that picture posted by Don Williams shows much more detail. And that structure looks like nothing that is left in Kirby Park that people keep referring to as zoo remains (myself included)…..It’s become this mystery that I feel compelled to solve! According to the bits of information that I could find, the zoo had monkeys, bears, deer, buffalo, wild game birds, and several other small animals….The concept kind of reminds me of that zoo at Hershey Park—they have black bears and wild turkeys, too! It’s funny; I’ve talk to more than a handful of people who have told me that they remember the elephants in Kirby Park! They must be confusing that zoo with Nay Aug Park—I don’t think any elephants ever loved next to the Susquehanna River! 😉 The Kirby Park Zoo was small…. The path that it was on is historically significant also—The Olmsted Brothers designed Kirby Park. They also did places like Central Park and the Vanderbilt Estate in addition to much of the landscape of the entire nation. One of their hallmarks was the concept of a path that could be used to walk or drive through a natural—a parkway for vehicles on a tour of nature. I would love to find pictures of what we now call The Olmsted Trail in Kirby Park back when the park was completed! Is there nothing at the museum? Who owns the land currently? how wonderful you wrote this! My mother told us stories of kirby park zoo and there were amusement rides there too… saw a picture once..not sure if I can find it again, but will look. I wish my mother was still alive 😦 you would have enjoyed the history you could learn from her. I drive by there all the time. I didn’t believe it when people told me that Croops Glen was an amusement park. I could not imagine that it was so. Now I don’t have to imagine. Great pictures. What a wonderful post and comments! I have often wondered about Croop’s Glen, and have photographed the site (without really knowing where I was – it’s just a nice place with a gate to nowhere! ), and I grew up and still live at Harveys Lake, so Hanson’s has always been on my radar screen. I’m glad to see that many people from our area are getting involved in preserving what we can of our not-so-distant past! I wish more people would comb through their old pictures, scrapbooks, etc., in an effort to retreive as much as we can about our past before it is forgotten. I’d like to see someone delve into the various locations of those “Dance Halls” that dotted the hillsides in the various town in our valley. I’m ever hopeful that someone will eventually come up with a picture of those unique wooden “troughs” that the mining operations built to prevent water from the streams on the mountain from seeping into the mines! Back again to your very interesting site. You have been busy ! I saw the photos posted of a woman named Jean and her father, the builder & keeper, it seems, of the two parks: Hanson’s and Croop’s Glen. He looks just like Spencer Tracy staring out of history at us. I lived in Plymouth in the late 1950’s and we used to hitchhike down Route 11 to Croop’s Glen to go swimming. No one said anything about an old park. We went for the cold water, sliding off the waterfalls into the deep basin, sunning out on the rocks – and we met other people there doing the same thing. No one ever bothered us. We even camped there, with campfires and hooting & shouting in the woods. I don’t know if we disturbed any neighbors or not, but we never saw another soul. We discovered the ruins of the old coasters overgrown in the woods, just as your photos show the extant buildings. Being impressionable kids, we thought they were the ruins of a lost city ! It took us a while to put together the idea that someone had actually built a roller coaster out here in the woods, next to the creek where we went swimming. That just really seemed like a delicious mystery. I came back in the 70’s and, again, enjoyed swimming, lying out on the rocks – brought some friends with me, we explored the place thoroughly. I’ve been back there as recently at 2010, and the only difference in 40 years was the “jungle” swallowed up more of the wood – it may have been washed away in mini-flood events – kids might have taken the dry boards and made fires with them. It was an abandoned ghost-town, just as you said, and anyone could go there to discover what they wanted to. Your articles, and the responses from people who lived there, have opened up the mystery so much more. No one else on the web seems aware of it ( Croop’s Glen ) – and what a big deal it was back in the day. Congratulations – I’ll keep reading. It really is a worth-while pursuit. Oh, and we did run into the mill owners once or twice. They had dogs, were threatening to shoot us if we didn’t get off their property and stay off – they really tried to put a scare into us. I guess they’d had it with vandals and kids like us trespassing on their property. But it was such an irresistible place. The water was the thing – the old ruins were just a curiosity. I guess what real estate people call, an ‘attractive nuisance’. Loved your idea of somehow restoring the place – rebuilding the park as a park, with an education center – photos, recordings – like a small museum – and some care taken of the beautiful natural features. I can easily imagine it being a place where the original natives came for hunting, camping, and ceremonial meetings. Who wouldn’t ? I also want to point out that on the same property of Croops Glen is a cemetary that has the family they named Hunlock Creek, PA after burried in it , Jonathon Hunlock and his wife Mary Hunlock. The entire property is extreamly historical. I have photos taken in 2012 of the cemetary and the head stones, contact me if you want the pictures or info on where to find this hard to find cemetary on the property. Just be careful because the property is marked no tresspassing and I also heard as of Sept of 2011 it is owned by new people who cleared alot of the items off the property and from the train station across the highway. I Grew up in the hotel across the street from Croops Glen. I know the layout of the park like a book. We played there for years after it closed,even got the rides running onetime.picked flowers at the old cemetary for my teachers.It was covered in Lillies of the Valley.There was also the remains of an old iron furnace up the creek from the sawmill. I would think it is gone from all the flooding.I have a photo of B.F.Croop taken at the park’s photo stand. It was run by Pat Garrick(or Garratt) and his wife ,they also ran the kiddyrides.Last time I was there(8 or 9 years ago0the only thing left was the refreshment stand and roller rink.The roller rink opersted for several years after the park closed.Would be glad to give you more information. It is a shame they demolished the whole neighborhood,it was the hub of Hunlocks. My father’s 5th or 6th grade class photo from Hanover twp. (1932) has “P.V(?) Garick, Croop’s Glen” written sideways along the side. I WOULD LOVE TO SEE AND HEAR MORE ABOUT THE PARKS AND THE ZOO..MY HUSBAND TOLD ME ABOUT CROOPS PARK, BUT IVE BEEN AT HANSON AS A KID..
WOW. I live in this area (Hunlock Creek), just up the road (not even a Minuit away). I have only herd stories of it and have explored the area various times. Still i was unaware of how far back in history it goes. What stuns me even more are those pictures! It’s really cool to see things that I’m aware of now, In it’s original condition. I know that part of the park is somewhat being used by people as there is an area up above the main area that is a perfect swimming hole. it’s locally known as “the Falls” or “Hunlock Creek Falls”. Up there you do see some holes in the rocks that look like they were not done naturally. It’s a great area and it’s interesting that something from the past (even if it’s indirectly) is still being used. My only gripe with this is often people pollute the area. Albert I have been trying to locate the person that now owns the property but have not been able to do so. It is one of the areas that I have been interested in hunting. There are many ways to preserve history and metal detecting provides one of the ways to do this. Uncovering the past out of layers of dirt and thinking of who touched it before or what they did with it. Would love to be able to hunt Croops and the old train station. From what I understand from talking to people there use to be a hotel that set on the corner that the old Hunlock Post Office is on. Charlene, you are correct their was a hotel there . The man that owns the property now lives in New York (long Island ) if you e mail me I can get you in touch with him . I grew up in Hunlock Creek and did some historical research of the area for a College paper. I was told by some long time residents that the park closed when the bandstand collapsed injuring or killing several people and the park shut down when they lost the case in court so the Croop family didn’t have the money to pay the judgment. I read elsewhere that Knobles Grove still uses part or all of the carousel from Croops Glen. I was also told that Mr. Hunlock’s grave is located elsewhere, a small cemetary a few miles south of the Hunlock Creek Road between the river and Route 11. Another site has some post cards of the Park with people swimming below the falls. My dad was born and raised in shickshinny. He remembers hitting his head on a cross beam on one of the coasters. The cemetary where Hunlock’s grave is 3/4 up to top of hill above the saw mill. I cleaned the brush out and bilt a fence around it and havent been back to see it since 1982 or 83. Jim Croop told me that the big gears were from the iron works down stream from the park at the river. Pretty sure #9 is the “Dodgem’s” (sp) from Hanson’s. #14 also looks like Hanson’s, however the background on the left looks like there may be a building. The dance floor is on the 2nd floor and you would not have seen a building there. I have photos I would have to find of Hanson’s right before they started work on the amphitheater. I grew up down the road, my family owns The Sportsman’s Bar. So I asked my mother about Croop’s Glen one day. What a surprise! She told me that her uncle often took she and her cousins there for picnics. Now this made sense. My mother was born in Wilkes-Barre but was raised by her Aunt in Benton. Sad to say, I have never known of any photos but if I find any, I’ll be sure to let you know! Also it is true that the carousel from Croop’s is at Knoebel’s and is in the kiddie section of the park. They also have a candy apple or cotton candy stand (it’s near the giant swing ride) and an old fashioned Wurlitzer organ that plays back by the roller coaster. I too moved to the area within the last 10 yrs and purchased land once owned by one of the Croops. I am obesessed with finding more photos and info on this park!!!! It is wonderful to see that some others are as excited and interested in preserving a very interesting part of our nepa history! ! !Kudos to Knoebels for purchasing items from Croops Glen as well as Rocky Glen…I am enjoying reading these- let’s keep the info coming!!! 🙂 Ali. P.
Amazing information about this park. Is it possible to still go and visit and possibly take pictures of the area. I am also in to metal detecting and would love to have an opportunity to visit and see if I could rescue any artifacts that may display the park’s heritage. Any information of the land owner would be greatly appreciated. Thank you. I am cleaning out my father’s estate; at the same time, I pulled a box of items out of the closet that my mother gave me well over 30 years ago. In it is a Croop’s Glen full body bathing suit (not sure if it is a womens or mens) with the initials C.G. written in cursive on the front. The tag identification is CROOP’S GLEN HUNLOCK, CREEK, P.A. suites made by Gantner & Mattern Co. San Francisco, Calif. I intended to sell it on ebay with no luck finding a like item to value it. 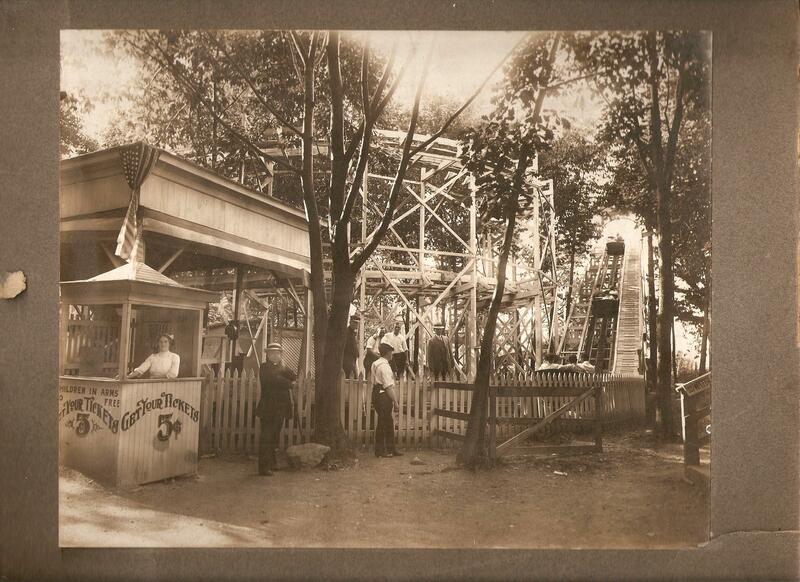 So, I hit the web and came across postings of the long lost amusement park in Pennsylvania…very interesting. The history of this specific suit has been lost; it belonged to a family member but I have no idea who owned it. It is up for sale but I do not know how to price it; can you help? I would tell her to seek out the advice of professionals. She can start by contacting Savo Auctioneers at 570-876-8100. My grandmother recalls being there when she was about 9 or 10 (she was born in 1928) when they were holding a baby contest and all the mothers were holding their babies on the bridge when it collapsed into the creek below. Yes! The kiddie carousel (S&G) and Whipper at Knoebels are from Croops Glen. After the S&G carousel left Groops Glen, it was at Knoebels from 1948-1950. It then went to Sunset Beach Park in Harvey’s Lake PA from 1950 to sometime in the 1960s. From that point to 1975, I believe it was kept in storage by private party. The carousel went back to Knoebels in 1975 and has been operating there ever since. I have lived in the Hunlock Creek/Rickett’s Glen area all my life (55yrs). I have never heard of Croops Glen & find all this (& the pics) extremely fascinating. My grandmother told me about riding the rides at Croops Glen many years ago. I have never been back in there but would love to walk back in and see it. I believe I’ve seen pictures of a big swimming pool cut out of the creek. I remember (1970’s) wandering around a defunct park, by Sylvan Lake, Sweet Valley, PA. We would ride our bikes there. The rink was there and old pictures and advertisements littered the place. I swear there was a ferris wheel skeleton as well. I was born in ’62, but that park must have been shut down years earlier. I do remember the Park at Harveys Lake though, and swimming at Sandy Beach as well. The place your referring to at Sylvan Lake was called PETE WOLFE`S it was a roller skating rink and dance hall . There were some small rides there also so a roller coaster was not out of the question . That park is Pete Wolf’s. Used to roller skate there and have reunions. Thank you so much for this walk back in time.. My father is 91 years old and remembers everything.. He grew up in Laurel Run and went to Handson’s Park at Harvey’s Lake.. I will ask him about Croop’s Glenn.. He may know more stories as well.. You should share this with a Facebook page that follows the history of Luzerne County. My mother and her sister and brother went to Croop’s Glen often as children. As a teenager in the 1950’s I swam in the “deep hole” in the creek. The pillars at the entrance are still there. Probably someone could find some artifacts if they explored the area.The sawmill was owned by Ed Babcock in the 1950’s and 1960’s.When my husband’s sawmill burned down in 1957, our loggers donated logs which Mr. Babcock then sawed into timbers for us to rebuild our sawmill which was in the Lake Silkworth area.I was more familiar with Sans Souci Park, the site of which is now occupied by the Hanover area Jr-Sr High School. I also have been to Rocky Glen and Hanson’s back in the 50’s. Several miles up the Hunlock Creek road was a small park called Rummage’s. It had a swimming pond, a roller rink, a 6-lane bowling alley, a picnic area, and maybe a small bar. I remember my mother and the other Hartman children talking of Croop’s Glen who only lived a little ways up the road from there. I look almost every time where the sign hung on the pillars when I turn off Rt. 11 towards Hunlock Creek. I also remember the saw mill, the gas station, the hotel, and the Croop’s homestead that sat in that same general area. The train use to go passing behind the gas station headed towards West Nanticoke passing Hunlock Creek Drive-In, Stookey’s Barbeque(both still in business), Bruni’s Auto, and Whitebreads Feed Mill.The gas station building still sets on Rt. 11 turned east to west in the woods on the right. I swam in the bath tubs as we called them on top of the falls when I was 5 or so, the park was not operational. I remember teenagers and adults crawling up the trees and diving into the water below (yes there were deaths in that pool of water). At Knobles in Elysburg Pa. they have a museum that has one of the Merry-Go-Round Horses from Croop’s Glen! As I grew up San Souci Park with the Roller Coaster being next to the highway was were we went. Then going to Lake-Lehman High School Sandy Beach was alive and hopping at Haveys Lake. Hanson’s was known for the amusement park and our 5 th class reunion. As time moves on it will be our 45th reunion this year. It is always a thrill to reminisce and pass on memories of things gone by. From what my dad has told me, the dance hall operated well into the 50s. My uncle used to go there back in tge day. The hall was shut down after it collapsed into the creek and a few teenagers died. The dance hall extended out over the creek. I have to tell you something that is truly strange. About 3 or 4 years ago friends of ours who live in Hunlock Creek lost their dogs. 3 big Great Danes A day later they found one down by route 11 but not the other two. We searched and searched. I heard about a psychic from California who you could call, there was a fee of course, and she would tell you where your dog was. She told us that she saw the dogs running in an old amusement park. We told her there was no such park in the area. She replied that that was where they were and that was what she saw. Later we came to find that there had been one there years ago …Croop’s Glen! The 2 dogs were found and except for some porcupine quills that had to be removed they all 3 were fine. They had no choice. They couldn’t sell the property until the owners passed away because of the lawsuits. The graves of the Hunlock family that founded Hunlock Creek are located on the Croop property. I did a report on the family a long time ago. A descendent of Mr. Croop took us deep into the woods to show us the old gravestones. I wonder if the current owners even know the graves are on their property. My Grandmother, Mildred Weiss (née Ellen Mildred Sorber) worked at Croop’s Glen when my mother (Virginia Weiss (Myer) was a kid. This would have been in the late 1920’s. She spent a lot of time at the park while her mom was working. They lived on art. 11 in West Nanticoke. My mom used to talk about the people she knew at Croop’s Glen quit a lot. She was especially fond of Jean Shelley. I have pictures and movies of Hanson’s Park from 1920’s until closing. Photo of whip is definitely not Hanson’s just for the record. I drive by here every single day & never noticed the remains of the park entry way until now!